Austin, TX – When the Texas Medical Board considers the cases of five abortionists this Friday, one of those who is scheduled to make an appearance is Douglas A. Karpen. His history deserves a closer look. The complaint against Karpen is based on two recordings made by women who had scheduled abortions at Northpark Medical Group in Dallas, Texas, at a time when Karpen was employed there. The calls, made Feb. 11, and Feb. 24, 2011, were identical recordings. There was no physician on the call to answer questions. This represents a violation of the State mandated informed consent law. Certainly women entertaining such a serious and final decision as abortion should be allowed to ask questions and be as informed as possible. That is the law. Karpen’s disregard for the informed consent law betrays a disregard for the women that come to him for medical care. If this was the only incident in Karpen’s career, it would still be a serious infraction of the law. But sadly, Karpen has a long and sorted history of disregard for women’s informed consent and for the safety of his patients that the Medical Board is being asked to take into consideration when deciding what discipline Karpen should receive. August 22, 1991: Nicolette C. was 16-years old when she drove from her home in Louisiana without her parent’s knowledge or consent for a second-trimester abortion at Karpen’s Women’s Pavillion. Karpen took the $1,800 dollars she had scraped together by pawning personal items and inserted laminaria. Nicolette was told to return the following day. After leaving the facility, Nicolette felt fetal movements. Since she had not been informed of the nature of the procedure or the development of her preborn baby, she began to have misgivings. Nicolette changed her mind about wanting her baby dead. Karpen refused and told her to continue with abortion. He wrongly told her that the procedure was irreversible and that any attempt to allow the pregnancy to continue would seriously threaten her health, which of course is not true. Many women have had laminaria removed and continued on to deliver healthy babies, although the risk of miscarriage remains high. Nicolette’s mother eventually tracked her down and joined her in Houston. 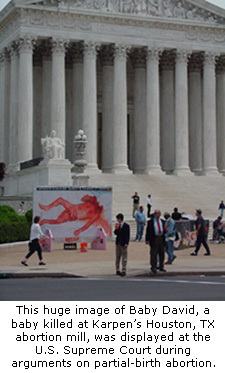 Together they attempted to persuade Karpen to stop the abortion. He wrongly told them that that reversal of the procedure could cause her to bleed to death, that it had never been done and that Nicolette would not be accepted in any hospital due to having the laminaria in place. Nicolette’s mother requested a referral to another doctor or hospital but was refused such and told to report to the facility the next day. When they got to Women’s Pavilion, mother and daughter were met by Richard Cunningham rather than by Karpen. They were informed that Cunningham and Karpen had consulted and did not wish to remove the laminaria and release Nicolette to other care. After 30 minutes of “high pressure scare tactics,” mother and daughter still wished to have the procedure stopped. Cunningham instructed them “to look in the yellow pages for an anti-abortion group,” insisted that they sign a release form, and had them leave the facility. February 6, 2005: A sewer broke at Karpen’s Texas Ambulatory Surgical Center, located at 2421 N. Shepherd in Houston, Texas causing sewage to spill into the parking lot of a neighboring car dealership. Maribeth Smith, an employee of the car dealership said she is convinced she saw human body parts mixed in with the sewage. She took photographs, believing the human tissue came from the clinic. These incidents paint a picture of Karpen’s seedy abortion practice and his well-established pattern of ignoring the law and disregarding a woman’s right to information about medical procedures. Time and again he denied women adequate information about abortion and misled them about their medical conditions. He has shown pattern of disrespect for the law and for the health and safety of his patients dating back to 1988. Traditional disciplinary means have seemed to have little or no effect on Karpen over the years. Therefore, Operation Rescue is asking the Texas Medical Board to impose the maximum penalty possible on him in order to protect the public and help him take measures to amend his ways.